Dr Fisher of Coniston is in fact two people, a husband and wife. According to the proprietor of the Lakelands Guest House, when you make an appointment to see “Dr Fisher” you never know which one you’re going to get. I limped into Dr Fisher’s rooms on the morning of Thursday, August 5th to be greeted by the female partner, an attractive young lady who spoke English with a gentle German burr. She sat me down and lifted my bare feet on to a neighbouring chair. She examined each toe close-up, then checked the balls of my feet and the heels. She recommended I buy gel-padded inner soles for my boots and she prescribed an ointment that would lessen the burning sensation in my feet and soften the skin. Then she spoke the words I had secretly been hoping to hear. The ointment was dispensed through a small pharmacy in the doctor’s reception area, and when I reached for my credit card I was halted by a vigorous shake of the head. I didn’t dare reveal the reality… that in Canberra no more than a handful of the hundreds of doctors and specialists in the city were prepared to provide free “bulk-billed” treatment. Whenever I visited my GP I had to pay the full cost of the consultation on the spot then claim a partial refund from a Medicare office. And free medicines in Australia? What a laugh! Dazed at my unexpected escape from financial punishment I joined Emmy in the waiting room. I reported Dr Fisher’s advice, translating it into my own words. Emmy struggled hard but unsuccessfully to paste a look of disappointment over her face. It was quickly decided… we would be heading for our next stopping point by taxi. 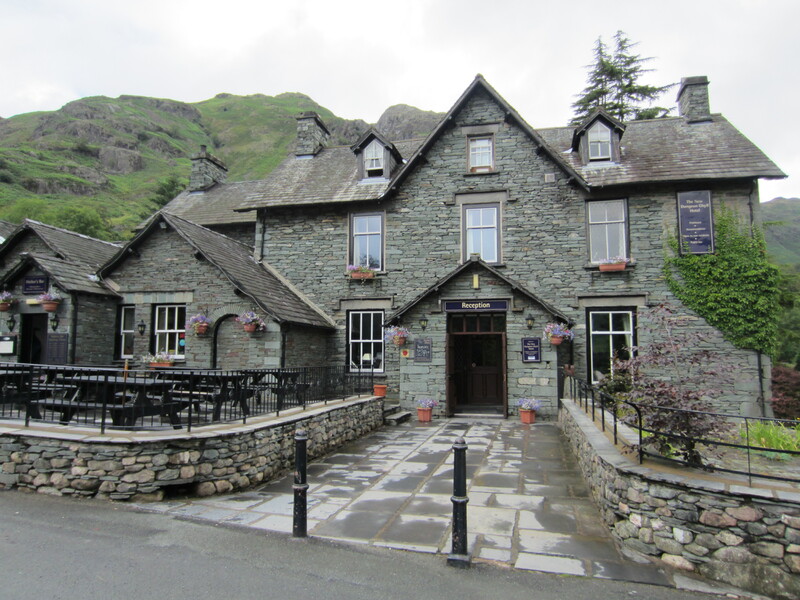 That is how, around 1.00 pm that day, after a comfortable taxi ride, we found ourselves sitting in the bar of the New Dungeon Ghyll Hotel enjoying a drink and smiling condescendingly at the stream of walkers who came stumbling through the door to slump over the bar and gasp for the consolation of alcohol. The New Dungeon Ghyll Hotel stands in naked isolation at the entrance to the Langdale Valley, one of the iconic features of the Lake District National Park. The treeless sides of the valley form an enormous letter U with its upper points prised apart. Early the following morning we were walking strongly into the valley over a rough scree path, heading for what looked like a cul-de-sac at the far end. My feet were pain-free and I felt a sudden rush of enjoyment. 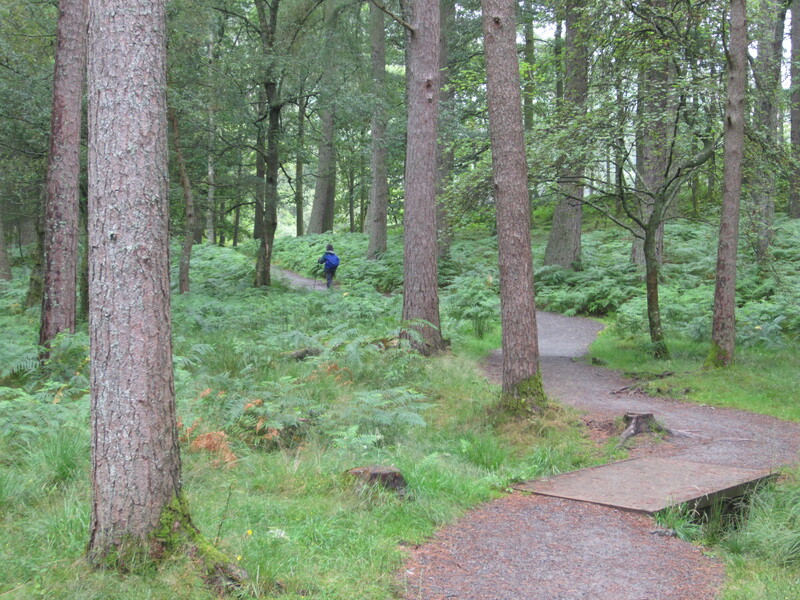 At the end of the valley we headed up a steep zig-zag path that cut through rough bracken. 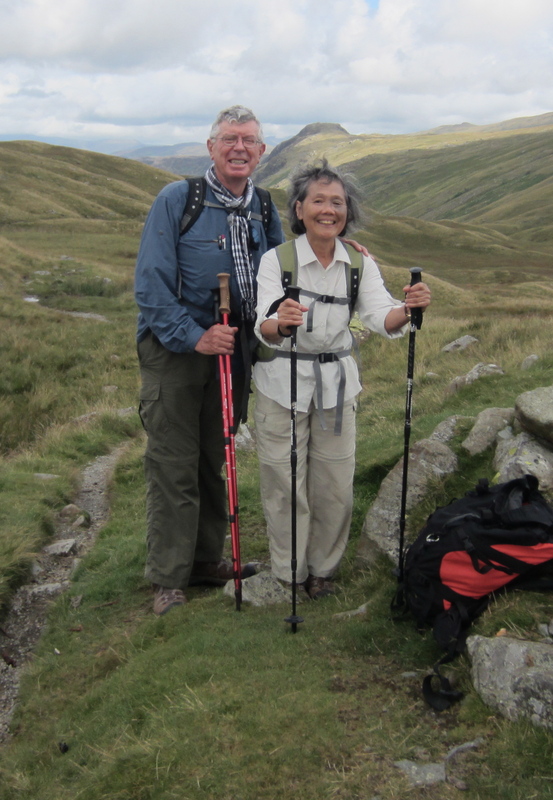 We made strenuous use of our walking poles and had to stop often to draw breath and drink. Looking behind us we saw a shining thread of water snaking away down the great moss-green trough of the valley. Hundreds of metres below, another group of walkers – as tiny as microbes – seemed frozen in the immense splendour of the landscape. It was a struggle of more than an hour for us to cover the couple of kilometres up to Stake Pass, at 478 metres the high point of the path out of the valley. We were far above the tree line, even above the bracken. In the still, high, empty air we could hear the voices of other walkers coming towards us from a kilometre away. Only boulders and wiry grass covered the worn ridges around us. Then we were moving precipitously downwards. We hobbled along a rough belt of loose rocks and stones. It fell away from us in a long series of hairpin bends. Again our walking poles were essential. With each downward step we tested the ground with our poles, braced ourselves against them and used them to maintain balance. The path was, frankly, dangerous. One slip, one stumble, one moment of inattention and we might have been pitched down a slope that in a couple of places was close to vertical. A mountain stream roared and whispered beside us all the way down. 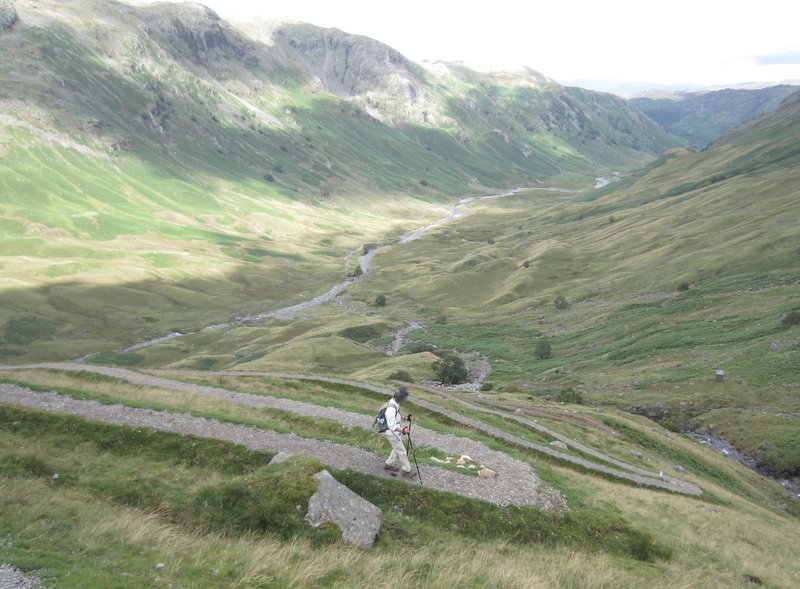 Our eyes were focussed on the immediacy of the path but again and again we stopped to take in the splendour of the vista that stretched bare and wild down the new valley before us. In the floor of the valley we hobbled and clambered over kilometres of uneven, rocky pathway. Whenever we found a few metres of flat ground that we could traverse at normal gait we savoured it like a luxury. But it never lasted long. The austere and beautiful drama of the day’s walk was still playing in our mind’s eye as we walked into the hamlet of Rosthwaite late that afternoon. Our accommodation was at the Royal Oak Hotel, a modest establishment run with the precision of a SWAT operation. When we checked in our hostess explained the rules. At exactly 7.00 pm an ear-shattering clamour rang through the hotel. It was our hostess thrashing the dinner gong. The guests came creeping from their rooms and lined up at the dining room door. Inside the door a waitress stood with a clipboard in her hand. We filed meekly to our tables. When everyone was seated the room was invaded by a mini-squad of two waitresses carrying plates of thin vegetable gruel. They distributed these rapidly and were followed by a third waitress carrying a wooden board with bread on it. A thick slice of brown bread dropped on to my plate. We supped in stunned silence. As soon as the last spoonful of gruel had been scooped up, the plate was snatched away and replaced by another filled with a soggy slice of steak and mushroom pie. A dish of vegetables also arrived: a ration of carrot, cauliflower and cabbage boiled and (I guessed) boiled again just to make sure it really was boiled right through. 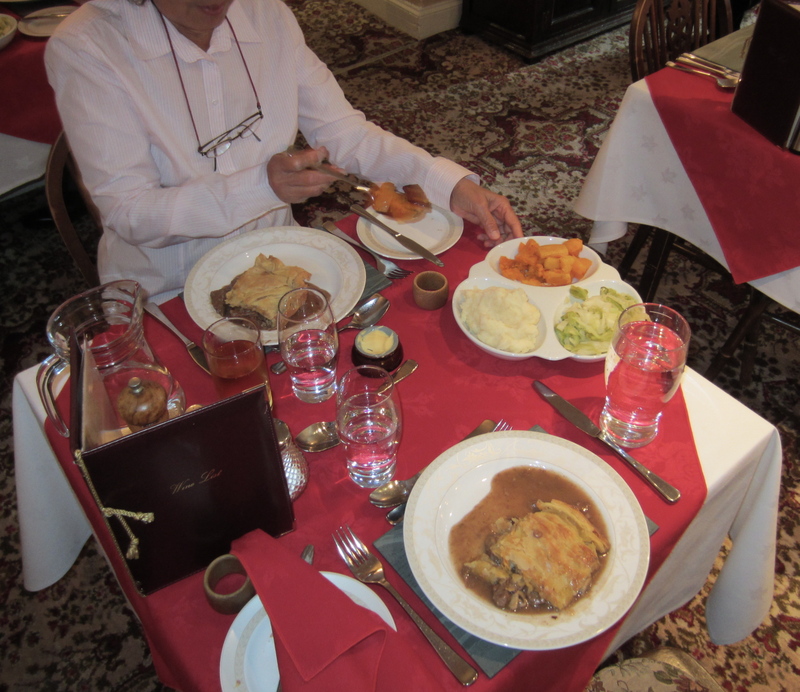 Every time we looked up a waitress would hurry to our table with a tray eager to grab our plates and cutlery. So we ate with our heads down. Dessert was a poached pear in sugary sauce. It was quite nice but we scarcely had time to enjoy it before the head waitress – her eye glancing nervously at the dining room clock – announced that tea and coffee would be served in the hotel lounge. 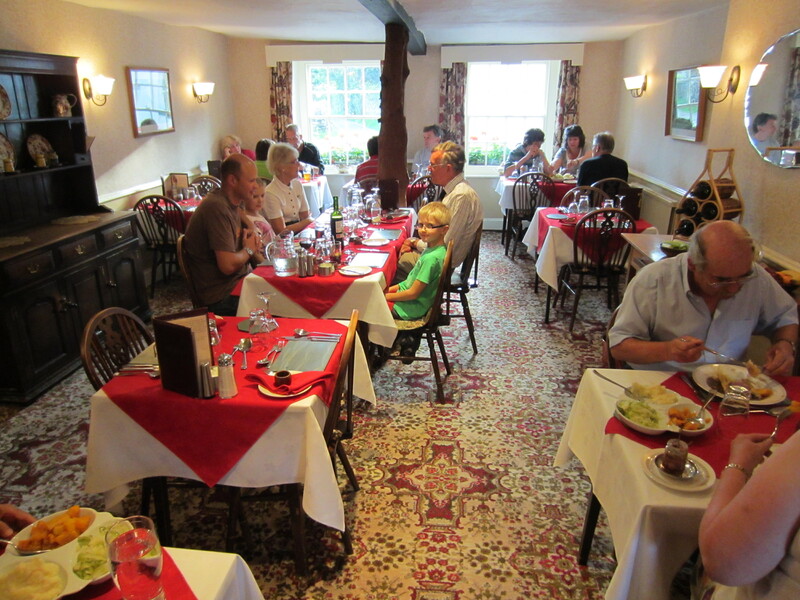 By eight o’clock the dining room was empty and had been made ready for the next day’s breakfast. I pose in my wet weather gear in the hamlet of Grange. Scarves of dank mist lie over the hills and smoke rises into the chilly air from the chimney of a nearby cottage. The next day dawned overcast and cool. 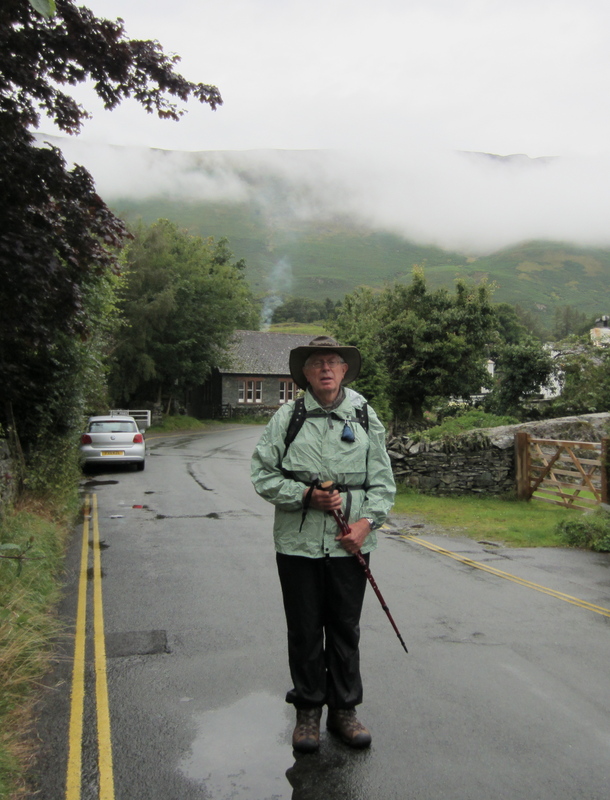 We had walked scarcely one kilometre out of Rosthwaite when light rain began to fall. For the first time in our travels we broke out our wet weather gear: rainproof leggings, rain jackets and a waterproof cover for our backpacks. The rain intensified and the track became boggy, but we walked with exhilaration. We were passing through woodland along the banks of a stream. A dense mosaic of foliage formed a ceiling over quietly flowing water and feathery, dripping undergrowth. Every twist in the path seemed to open a new page of bright greenery, lustrous with water. In the hamlet of Grange we stopped at the one-and-only shop to sit under the verandah and enjoy tea and scones. The instant we sat down the rain stopped, and as we stood up to resume our walk the rain rejoined us too. 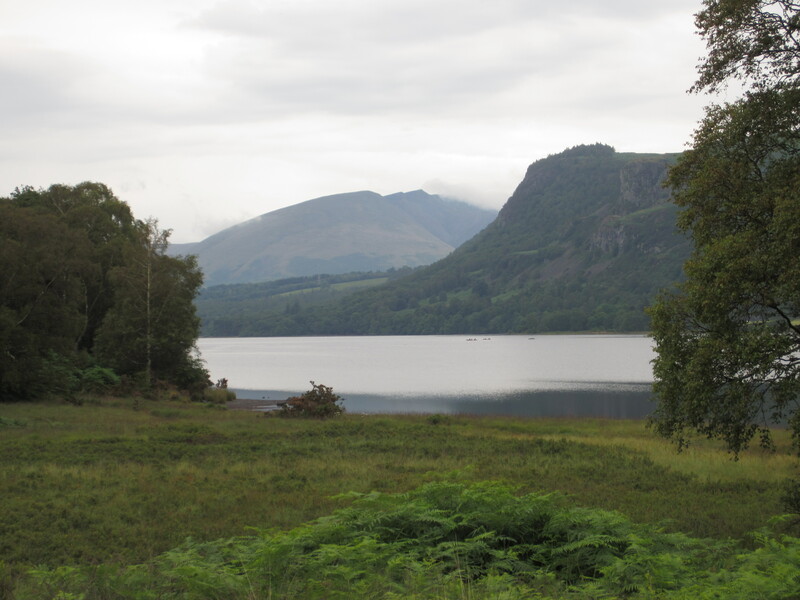 It stayed with us – never intense but steady and friendly – until, through arches of trees we saw the muted gleam of Derwent Water. 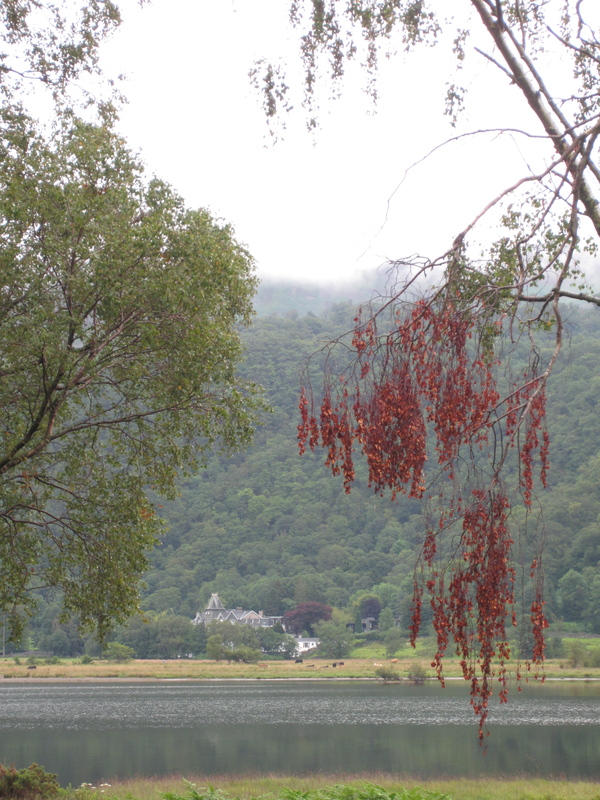 Across the lake, half hidden among trees, there were stone houses and mansions. We had wandered into an Arcadia of woods and water and forest lodges. It was beautiful beyond description. As we walked along the western shore of the lake we passed several jetties. At one of them a small ferry had puttered up to stop for a few moments and discharge several passengers. Emmy and I did not need to consult each other. We hurried along the jetty and clambered aboard. I recalled the cry-from-the-heart of Xenaphon’s soldier Leon of Thurii as he arrived on the shores of the Black Sea after his column’s long trek from the hinterland of Persia 2500 years ago (mentioned in a previous post). I leaned back on my varnished wooden bench and watched the lake ripple out from the bow of the boat as it headed towards Keswick. 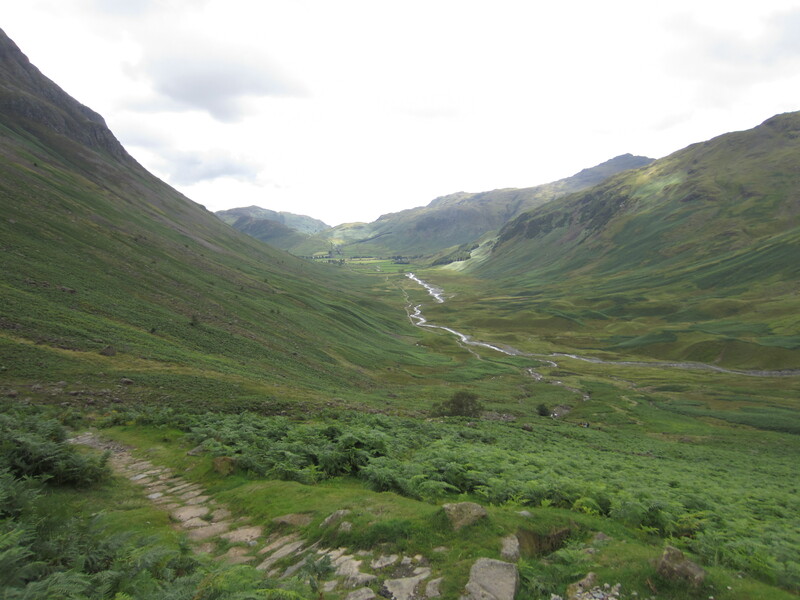 This entry was posted in Cumbria Way by George Quinn. Bookmark the permalink. ” And I somehow rather fancy that I’d like to change with Clancy, Like to take a turn at “walking” where the seasons come and go….”. Keep up the entrys Big Gee – the’re keeping me warm.